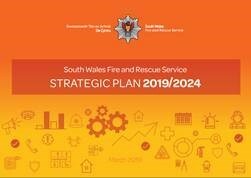 Welcome to South Wales Fire and Rescue Service’s (SWFRS) Strategic Plan for 2019–2024. This document introduces our strategic plan and explains how we intend to continue to deliver high quality services that meet the needs of our communities. Our Vision remains our key focus; “Making South Wales safer by reducing risk”. This plan outlines our intentions for 2019-2024 based around achieving, or working towards the achievement of, our priority actions. The plan also sets out our financial commitments from Local Authority settlements and identifies where we intend to allocate spending. It details what we aim to do, whom we will work with, how we plan to deliver it and why we believe, it is important. We invite you to feedback your thoughts on this plan in either Welsh or English, as we are always looking for ways to engage with you and improve.